Charming home in Old Town Norco! New on market! This is worth a look if you like large gatherings, want the country charm Norco has to offer or just need to have space to unwind after work and/or on weekends This pool home offers almost 2,000 square feet, 4 bedrooms and 3 baths. Two bedrooms and two baths are upstairs and two bedrooms with one bath are downstairs. Walls have been re-textured, ceilings have been scraped and re-textured. All bedrooms have ceiling fans. There have been some upgrades and improvements by current owners including 2 year new air conditioning. This home is ready for final touches to make it your own. The lot size is over 20,000+ square feet with plenty of area for horses, chickens, goats and there is already a large vegetable garden ready for planting. Additionally there are two out buildings, RV parking and storage area. There are assorted fruit trees. 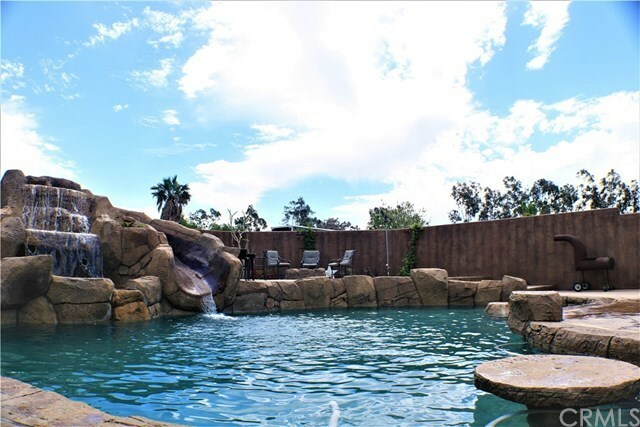 The home is located close to shopping, restaurants and plus miles of horse trails with quick access to the Santa Ana Riverbed. Master bedroom and bath are located upstairs and has a large Jacuzzi bath tub and two walk-in closets plus dry bar with refrigerator. Inside laundry is located upstairs in second bathroom. The gorgeous rock pool has a water slide and a spa enclosed in a grotto with a water fall. There are two dump stations on the property for RV use. Conveniently located with quick access to 15, 91 & 60 freeways!